The Government’s request for a further US$ 1.5 billion loan from the IMF has been turned down on two grounds: that the IMF does not provide budget support to governments and that Sri Lanka’s external reserves have now reached a level of about US$ 7 billion and “accordingly, there appears to be a very limited need to build up a further cushion in external reserves through traditional IMF Balance of Payment support programmes, such as Stand-By Arrangements and Extended Fund Facilities”. The IMF loan request has raised a multiplicity of fundamental issues on the external finances and the economy. The issues discussed at the IMF media conference reveal the fundamental weaknesses of the economy and needed reforms. These provide the clues to where action is needed to resolve the fundamental weaknesses of the economy: The fiscal and trade imbalances. The country is already heavily indebted and there are concerns and fears that it is moving into a debt trap. A significant proportion of the country’s earnings would be needed to service the foreign debt. This would in turn strain the balance of payments. In the first place it is confusing as to why the Government asked a loan of US$ 1.5 billion as budgetary support when it is well known that the IMF does not provide such support except under exceptional circumstances. Was it a roundabout way of obtaining balance of payments support and hiding the true reasons for wanting to borrow? Many wonder why we should borrow when reserves are said to be high. Others ask the question is it really necessary to borrow and increase our foreign debt further? And again there are those who ask for what purposes are these borrowings? Will they contribute to a strengthening of the economy or be a burden in future years? Then, many are confused as to how an economy that grew at 8 percent in 2010 and 2011 and is supposed to have grown at about 6 percent last year had large trade deficits. These are all valid questions to ask about the external finances of the country. Let us begin with the question why the country is borrowing when it has high reserves of US$ 6.7 billion in the tank. The latest Central Bank statement on the external finances states that the external reserves increased to US$ 6.87 billion by the end of 2012, while total international reserves which include foreign assets of commercial banks, amounted to US$ 8.36 billion at the end of 2012. Furthermore, the Central Bank points outthat gross official reserves were equivalent to 4.3 months of imports by the end of 2012, while total reserves were equivalent to 5.3 months of imports. The IMF has also said that with reserves of nearly US$ 7 billion there was no need to borrow to enhance reserves further. Despite these statements, there may be several reasons why this reserve is inadequate and why the Government is seeking to replenish the reserves. The figure of US$ 6.8 billion is of gross reserves. There are debt service commitments during the year and therefore much of it may not be available for financing current government expenditure. The net reserves are perhaps much less in the region of US$ 3 billion that is a risky reserve. The question of whether we need to borrow further is answered when there is a realisation that the really effective reserves of the country are not the gross reserves but the net position. Unfortunately, the Central Bank does not disclose the debt servicing commitments to assess the adequacy of the current reserves. It is most likely that there is a necessity to borrow as the foreign exchange reserves are inadequate to meet its current commitments. The statistic of the number of months of imports the reserve could finance is misleading. It is not only the number of month’s imports that matter but the total potential foreign expenditure. It must also be noted that these reserves that the country boasts of are not earned foreign exchange but consists largely of foreign borrowing. Therefore the net foreign exchange reserves are in fact too low for comfort. Furthermore, the Government may have intentions on spending on large investment projects that have high import content or assisting foreign countries such as Uganda that is being given US$ 150 million for a clean water project. 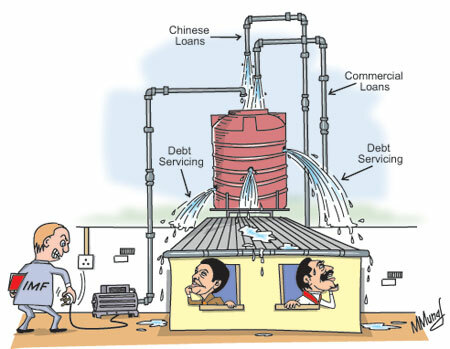 The conditions for repayment of Chinese loans are not known, even perhaps to the IMF, and there may be large repayments due. Additionally, borrowing from the IMF at lower rates of interest and long periods of repayment and repaying other loans could be part of the debt reducing strategy that is envisaged. The country has been incurring large amounts of foreign debt in the last few years. In 2005 the foreign debt was US$ 10.52 billion. It has doubled since then to US$ 22.82 at the end of 2012. In fact the actual foreign debt may be higher, as some debts may not be included in this figure. Some estimates place it as high as US$ 28 billion. There are also loans taken by state banks that are not included here though they are contingent liabilities of the Government. Differed payments are also part of the country’s liabilities. The large increase in the country’s foreign debt in recent years and increasing foreign debt servicing costs are a serious concern. The Ministry of Finance estimated Sri Lanka’s foreign debt servicing costs comprising both principal and interest payments for 2011 to be US$ 954.5 million and expected to nearly double in 2012 to an estimated US$ 1,539.4 million. The sharp increases in debt servicing costs are due to increased borrowing in recent years, especially after 2009. About 20 percent or more of export earnings would perhaps be required to be expended on servicing the current debt. Foreign debt should be incurred for developmental purposes. According to the Ministry of Finance, 75 percent of recent foreign borrowing has been for infrastructure development such as for power and energy, ports, roads, bridges, water supply, agriculture, fisheries and irrigation, among others. Nevertheless all infrastructure development is not necessarily justified from an economic perspective. Infrastructure projects that either save or earn foreign exchange are the least burdensome to the balance of payments. Prioritisation of infrastructure development on this criterion is a prudent economic strategy. Otherwise the debt servicing costs would escalate to create a further strain on the balance of payments. The balance of payments difficulties created by large government investment projects underlie the need to prioritise investments in consideration of foreign costs, export earnings and import savings. Furthermore, as large infrastructure projects have long periods of gestation it is important to phase them over time so that the fiscal burden and balance of payments strain is minimized. The large expenditure on infrastructure development is to a significant extent responsible for both high fiscal and trade deficits. The fundamental issues raised by the IMF require to be addressed. Couched in diplomatic language, the mission chief stressed the need to realise the fiscal deficit targets, increase revenue collection, reform public enterprises, adopt pricing mechanisms to reflect international prices and contain infrastructure investment. These are the issues that must be addressed to ensure the country does not face a balance of payments crisis.